In this small country – where poverty persists, food safety concerns reign and the population is devastated by HIV/AIDS – the situation for children is very problematic. In this country where life expectancy was only 48 years old in 2010, approximately two-thirds of the population live in extreme poverty. 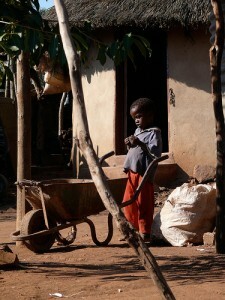 In fact, 70% of Swazis live on less than a dollar per day. The weather conditions are unstable: droughts and the food safety issues they trigger have detrimental effects on the food supply and consequently, on the health of the youth. A large number of vegetable varieties that are resistant to droughts have stopped being cultivated. The country depends largely on corn – which has undergone price increases too great for household budgets. Along with the general economic slowdown as in all countries and the significant increase in unemployment these factors have made numerous households – already unable to feed their own children – turn away orphans or other needy children who would, in other times, be welcomed in the name of the “extended family.”. Even though some schools can offer daily, adequate lunches to children thanks to external financial aid, there are still many who remain starving, notably in the country. It should be noted that the government is several months late in paying for aid for needy children, yet the king leads a lifestyle of luxury..
but also by inducing their own illnesses which often leads to serious complications – something that is not easy to talk about. The sickness kills prematurely and is very difficult to live with due to the shortage of qualified medical personnel, the lack of access to treatment, the complexity of the illness, and its severity. Unfortunately, 42% of pregnant women are infected with HIV/AIDS and very few of them benefit from the treatment to prevent the transmission of the virus to their child. This suggests a deterioration of the situation. 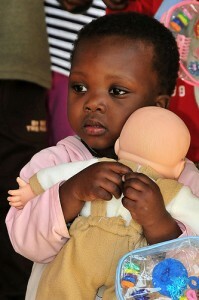 A support center for infected infants was created but there are too many cases for everyone to have access. The health, hygienic, and water supply systems are in poor condition and have led to an outbreak of illnesses such as cholera and diarrheal sicknesses that still kill many children. Each day children beg their neighbors for water. 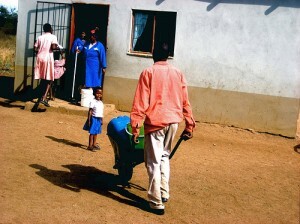 Many schools do not have running water and must count on deliveries from the government to fill their reservoirs during the dry season. However this doesn’t always happen in zones that are further away. 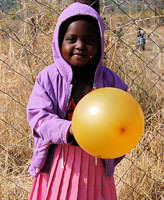 The number of orphans has reached record highs in Swaziland especially owing to the numerous parental deaths caused by HIV/AIDS and the departure of the remaining parent to search for work or money. Very few orphanages exist and there are no guidelines in place to regulate them. 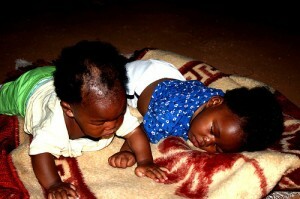 As a result, a child is the head of the family in 10-15% of Swazi families today. When possible the grandparents take in the children. There are also “Kagogo” centers – traditionally “grandmother’s houses” – that have become social service centers for vulnerable children. access children have to education. Despite constitutional provisions and a judgment from the High Court, primary school is still not free for Swazi children. The directors of some schools even physically threaten children if they attempt to go to classes without paying. More than 10% of academic withdrawals occur within the first few months of term because the children’s families need to use the money initially meant for school-related fees to pay for the ever- increasing costs of food and water. By necessity, many children become prostitutes to survive. Given the level of poverty, exploitation and sexual services are rising. The lack of measures taken to raise awareness and prevent these types of practices towards children is deplorable. The Constitution authorizes “moderate punishments” and courts sentence physical punishments as penalties. Outside of the realm of legality, these acts are accepted and widespread in everyday life. Despite the establishment of a team to protect children, there have been no awareness campaigns nor education regulations put in place in favor of employing other forms of discipline that respect the dignity of children. These acts of violence often occur in the homes located in rural areas and the aggressors are usually fathers or other close family members. Only 43% of girls state that they freely consented to their first sexual experience. Moreover, young girls do not always understand that they have experienced sexual abuse and have the right to openly present a case to report the abuse. Many discriminatory practices have been documented toward children infected by HIV/AIDS: albino children, children born out of wedlock, but above all handicapped children and little girls. 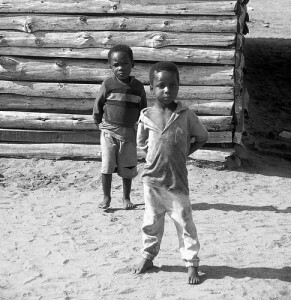 The Swazi population harbors a false conception of handicapped children often based on fear. Handicaps there are usually considered a curse or punishment for the parents who had not succeeded in satisfying their ancestors or for the mother who broke a taboo during her pregnancy. In the same way, epileptics are perceived as afflicted by evil spirits due to their violent attacks, which are similar to demonic possessions. As a result, there is a diminishment in access to healthcare, education, sports facilities and every day conveniences. Young girls are disproportionately affected (affected more than boys) by violence, poverty and the HIV/AIDS pandemic. Adolescents are victims of marginalization and stereotypes. They seldom finish their schooling. Women do not have the right to own land, which is problematic particularly concerning girl orphans who act as heads of the family. 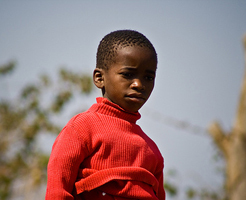 In Swaziland there is no legal protection against forced or premature marriages, known as Kutekwa and Kwendziswa, which have negative consequences on the health and development of children. Measures have been taken to improve the system—such as the creation of local committees— and still less than half of the incidences of sexual abuse and other mistreatments are reported to the authorities. 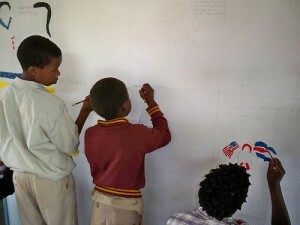 In fact, children only ask for help in cases where violence reaches a level of drastic severity. Thus, the absence of a detention system for minors forces detained children to share cells with adult criminals. Registering births in Swaziland is not easy. The service costs money and is rarely accessible in the countryside. Consequently, few children are registered at birth and those who are not registered do not feel prompted to complete this step when they are older.